November 14, 2016 November 14, 2016 / Julie Brook, Esq. How do you object in trial without being objectionable to the jury? Perhaps it’s impossible: A jury naturally resents the attorney who constantly leaps up and breaks the flow of information. But there are a few ways to make yourself less objectionable to the jury. The first rule to “objecting without being objectionable” is to do most of your objecting out of the presence of the jury. You can make a motion in limine before the testimony in front the judge alone. But no one can anticipate all potential objections by motions in limine, and no judge would want to hear all potential objections. So some objections in front of the jury will be inevitable. 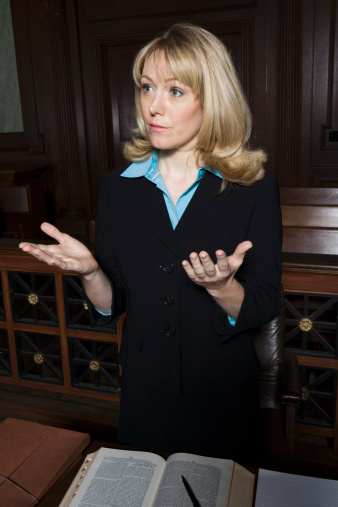 The jury will look more kindly on your objections if they understand the reasons for them. Learn to object in a comprehensible way: You’ll have to use legal language but add in a plain language sentence or two to give the jury your valid reasons for the objection. Confusing. “I object, Your Honor. Mr. Smith has put two questions in one, asking for both the time of the accident and the location of the traffic light. It is compound and ambiguous.” Although for this one, why make the objection at all? If the question is confusing, leave the court and the jury confused. If the objection is sustained, halfway competent counsel will simply rephrase it and eliminate the confusion. Unresponsive. “Excuse me for interrupting, Ms. Green, but I asked you only what time you left the office. Your Honor, I move to strike Ms. Green’s testimony about the argument she had with Mr. Brown on April 13.” This objection is inadvisable for the nonquestioning attorney because, if the motion is sustained, the questioner has the option of immediately following up with the question that calls for the previously “unresponsive” answer. The result: The jury hears the answer twice. Assumes facts not in evidence. “Mr. Brown knows there is no proof at all of ‘X’. His question should be limited to matters that can be proved.” Use this objection only if the questioning attorney is insinuating to the jury facts that can’t be proved or that the witness can’t be expected to adopt. Asked and answered. “I object. We have heard this testimony over and over again, and it is becoming cumulative.” Because there’s actually no rule against asking a question twice, don’t use this objection unless opposing counsel is beating a question to death. Privileged. “Ms. Smith is an experienced attorney. She knows asking about that is totally improper because it is privileged.” Jurors have scant sympathy for privileges, so make this objection in advance in limine if you can predict it. You should make up a longer list of comprehensible objections and frame many of them in ordinary words. Compose your list before trial, and your plain language will flow smoothly when the adrenaline is surging. These trial skill tips and many more are in chapter 13 of CEB’s Effective Direct and Cross-Examination. Get detailed information on all of these objections and others in CEB’s California Trial Objections. And check out CEB’s program Objections: Best Practices for Objecting to Evidence at Trial, available On Demand. I suspect some of these objections would draw judicial ire as being speaking objections, particularly 6, 10, and 11. On 5, California has abolished the Best Evidence rule and replaced it with the Secondary Evidence rule (Evid. Code, sections 1520-1523). Thanks for catching the best evidence rule reference, I’ve edited it in the post. In terms of the possibility of drawing judicial ire, this post was advice from experienced trial lawyers based on their experience. In specific instances, the trial lawyer will need to read the judge and the jury, and then evaluate what will work and what will not.